Stand alone or series: Stand alone but with room for more. When 15-year-old Ejii witnesses her father’s beheading, her world shatters. She embarks on a mystical journey to track down his assassin. But she soon discovers that her journey has greater purpose. Spontaneous forests, polygamy, strange insects, Nigerian 419 scammers, really fast cars, a different kind of Sahara Desert, male beauty contests, the apocalypse, life, death, sword fights, fat chiefs, assassins – THE SHADOW SPEAKER is a wild story of mind-blowing technology and tantalising magic, set in an alternate version of the country of Niger. Why did I read this book: I saw the book at the book shop and bought it solely based on the cover without knowing anything about it. I picked up The Shadow Speaker on a whim. I was at the book store (Foyles, my favourite book shop on the whole wide world) and they had this one book facing me and I was immediately grabbed by the cover. Upon learning that the book was set in a futuristic Africa, I went and bought it, having never read anything about it or its author. And wouldn’t you know, only a couple of days later, Nnedi Okorafor ‘s Who Fears Death was picked as one of Amazon’s top 10 Science Fiction and Fantasy of 2010, which made me move The Shadow Speaker to the top of the TBR mountain. 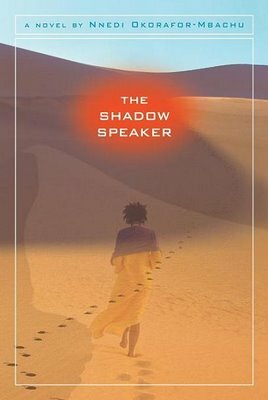 The Shadow Speaker is set in Nigeria and the Sahara in the year 2070. The world has changed dramatically ever since when, early in the 21st century, nuclear bombs were detonated in conjunction with what has been called a Peace Bomb, a bio-magical bomb created by a crazy dude in Haiti. The Great Change – that’s what the events have been called – has caused mutations in human beings who can now fly, or make rain and a varied number of other abilities. But it also has opened the boundaries of Earth to other planets and dimensions as well causing a number of other unstable happenings: forests pop up everywhere, even in the middle of the desert, for example. And of course, a Great Change like that could not come without economic, politic, technological and religious consequences. Ejii is our narrator, a 14 year old Shadow Speaker who lives in a small town in Nigeria where all of these elements are very much still playing. She is still learning about her abilities which include communication with shadows (I am not very clear as to whether these are spirits of death people or something else entirely) and reading thoughts and feelings of those she comes into contact with. She is also the daughter of a former dictator and witnessed his death in the hands of Sarauniya Jaa, AKA the Red Queen who brought peace (by violent means) to the region. Now, a few years later Ejii finds out that Jaa would like to groom her to be her successor, but her mother thinks she is too young. But the Shadows tell Ejii that she must follow Jaa in order to prevent a war between Earth and the planet Ginen and Ejii sets out with her speaking camel Onion in order to prevent the war by any means necessary. There is a lot that I liked about The Shadow Speaker. It is a book full of awesome elements and ideas, starting with the setting in Africa, a setting I hardly, if ever, see in books. The world that the author created is amazing: there is this futuristic, highly technological, science fictional feel, but also maintains a lot of traditional elements in the way that people react to these devices, in the almost tribal relationships within Ejii’s village with its oral historians. Similarly, Ejii is a complex mix of past and future, and her father plays a significant role in how she behaves and acts as a woman. She is Muslim, and her father was a fundamentalist leader who believed that women had very specific, limited roles to play, and during the time he led the village, Ejii was happy to play those roles. When he is killed and the village liberated by Jaa, a highly powerful, emancipated woman-warrior in a polyamorous relationship with two husbands, Ejii starts to grow up, and needs to find her own footing. Her quest for Jaa is also a quest in which she becomes aware of her limitations and upbringing, and she has to choose which roles she will play. Similarly, Ejii’s love-hate relationship with Jaa is one where her choices also involve discussion about violence and whether it can be used for the greater good. For all of this, I rather enjoyed reading this book. But this enjoyment never grew to anything MORE, and as much I liked the ideas in the book, I didn’t love it and was left feeling underwhelmed once I had finished The Shadow Speaker. Setting, ideas and world-building aside, the main plot of the book is a paint-by-numbers Quest that never really provided real tension bearing in mind all that was at stake. The religious aspects of the novel were never explored in depth (if Ejii is a Muslim and prays for Allah – but not everyday – how does she deal with the idea of other Gods and Goddesses?). The denouement of the novel felt slightly simplistic given how complex the issues were, and Ejii’s role never felt truly believable. As much as I liked the characters, I didn’t feel especially connected to any of them or invested enough to care, because as interesting as they were in theory, their execution never lived up to their potential. Ultimately I think The Shadow Speaker is a good book, just not as good as its promising premise. As the green shape grew, the earthquake subsided. Soon everyone had turned south, watching and waiting. Even the crying children and roaring camels had gotten quiet. The green tint soon spread over the sky, quickly approaching them. Ejii grasped her mother’s hand and touched the amulet that hung from her neck with her other hand. She could hear her mother whisper, “Inshallah,” -God willing, her mother whispered. Then the green wave came with a WHOOOOSH! Its wind pushed everyone a few steps north, only the toddlers and the very old fell to the ground. Palm trees bent northward and monkey bread trees lost all their fruits. The strength of the wave forced Ejii to inhale deeply as it passed. It smelled of a thousand roses blooming at the same time in the same place for the same reason. She sneezed and looked at her mother and they both pressed closer to each other. It wasn’t the end. It was another beginning. But of what? Interesting review. I’ve been reading quite a bit of Nigerian lit in the past few years and am hoping to read Who Fears Death sometime soon. I’m wondering if perhaps in her later book she was able to pull in those places where you found the book was lacking? I would assume given the fact that it made the top 10 Amazon list. Anyway more of a ramble than a real comment here but I’m glad you read and liked this book, and I do hope you consider more Nigerian authors! And I definitely plan on reading Who Fears Death at some point. I read this book a while ago and I did enjoy it, though mostly for various extraterrestrials in the meeting. I do agree though that there’s a layer of separation from the characters about it; I enjoyed the read without being on the edge of my seat worrying about the fate of the characters, even if the fate of the world hangs on the balance. Ana, I don’t read a lot of fantasy and haven’t actually found a lot of young adult Nigerian literature yet, but some authors that I’ve really enjoyed include: Chimamanda Ngozi Adichie, Helon Habila, Adaobi Tricia Nwaubani, Chinua Achebe, Wole Soyinka. There are so many more though. Definitely going to have to pick this one up – it sounds fascinating, even with its flaws.